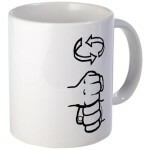 On a related note, you can buy Susan’s ASL Coffee mug on Cafepress, without the risks involved in commerce with sketchy strangers! Get yours today! Descartes Week concludes! I hope you have enjoyed our Christmas present to you. Enjoy your Christmas, and tune in on Tuesday for a comic that is not about Descartes. Welcome to Descartes Week! We’ll be bringing you Descartes, his comics, and comics about his comics every day of the week. This is apparently how we celebrate Christmas around here, so I, uh, hope you like Descartes. Vote for SC at Top Web Comics and receive a bonus postscript panel to today’s comic! For those who Facebook, the bonus panel is also available in the Facebook page’s Deleted Scenes Gallery.